A safe and gentle, chlorine free, bleach that very effectively removes stains and brightens whites. Non-toxic and biodegradable, Natural Bleach releases oxygen when diluted in water and is the most natural bleach next to sunlight. Safe for coloured fabrics and whites. Safe for septic tanks. 100% paper packaging which is fully recyclable and fully compostable. Vegan and Palm Oil free. A Natural Bleach, also known as oxygen bleach, is a safe and non-toxic, biodegradable alternative to harsh chlorine bleach. When dissolved in water it releases oxygen which acts as a powerful stain remover and deodoriser. It breaks down harmlessly to oxygen, water and sodium carbonate. 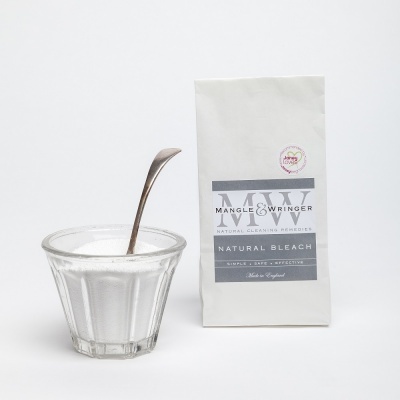 This miracle product brightens both whites and coloured fabrics and prevents them from yellowing. It’s great at removing organic stains like tea and coffee, fruit juice, food sauces, grass stains, pet stains, blood and red wine. Natural Bleach is also a great alternative to chlorine bleach in the bathroom. Dissolve in warm water to safely clean and disinfect the loo and clean drains. Also, use to easily and safely clean and bleach sinks, baths, cups, mugs, tea and coffee pots. Use two scoops in a bowl of warm water as a pre-soak to remove stains. As a stain-removal booster, add one scoop to the laundry powder in your washing machine dispenser drawer to brighten whites and eliminate odours. This product is supplied in 100% paper packaging which is fully recyclable and fully compostable.